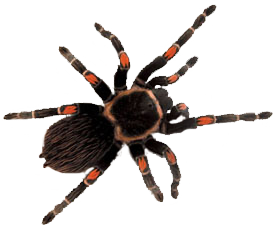 Welcome to this web page dedicated to tarantulas. But, why write another page on this subject? 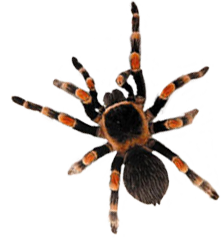 I think it is very important to discuss issues about the preservation of tarantulas in captivity in the way that is most beneficial to the tarantula, and not only about the appearance of the terrarium or the display that lets us keep the spider in view at all times. I have always said that a healthy tarantula is one that will be seldom seen, and only at night if that, because that is the way they behave in their habitat, hunting at night and burrowing during the day. They are also affected by changes in the environment, such as the different seasons, which will not take place in a place filled with decorative objects and an artificial climate. Everything that is discussed here is the result of years of experience in preserving these creatures in captivity, as well as the observation of their environments through the different seasons of the year. But even with this, what is stated here are just recommendations, not laws, based on common sense in most cases. Something very important that you should keep in mind is that your tarantula never chose to live with you, you chose it. It would be better off in the wild, but since you already have it, your obligation is to provide a habitat as close as possible to its natural one. I hope this information I gladly share with you on this page is useful. I only remind you that the methods and solutions I provide are those that have worked for me, and in no way should be considered as a rule.